AlphaNinja: Opentable's IPO prices above range. $540million market cap. REALLY? Opentable's IPO prices above range. $540million market cap. REALLY? SAN FRANCISCO--(BUSINESS WIRE)--OpenTable, Inc., a leading provider of free online reservations for diners and guest management systems for restaurants, today announced the pricing of its initial public offering of 3,000,000 shares of common stock at a price of $20.00 per share. A total of 1,572,684 shares are being offered by OpenTable, Inc., and a total of 1,427,316 shares are being offered by selling stockholders. AlphaNinja - First off, thanks to OpenTable for a such a detailed, transparent S-1 (seriously, not being sarcastic). A worry here is that fully HALF of the offering is by selling stockholders, meaning they're cashing out and none of that money goes to Opentable. Anyway. 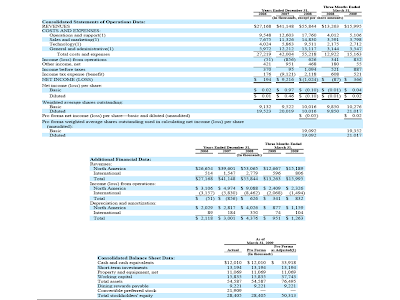 After the offering, Opentable has 20million shares outstanding, valuing the company at $540million. That is ten times sales. Ridiculous.